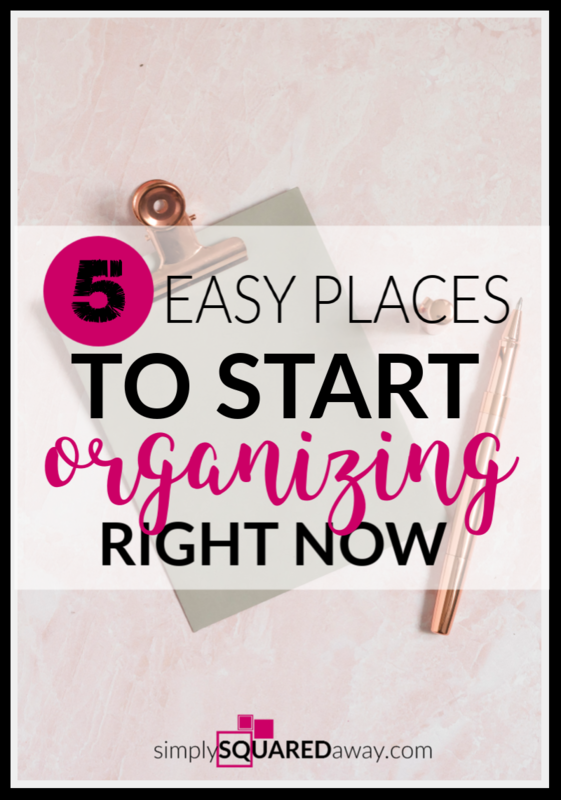 I’m going to share five easy places to start organizing right now. Pick one. 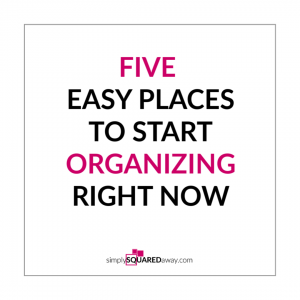 Use the tips I share and organize one of the five. 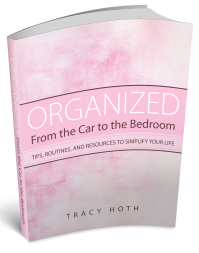 You know you want to get your home organized. 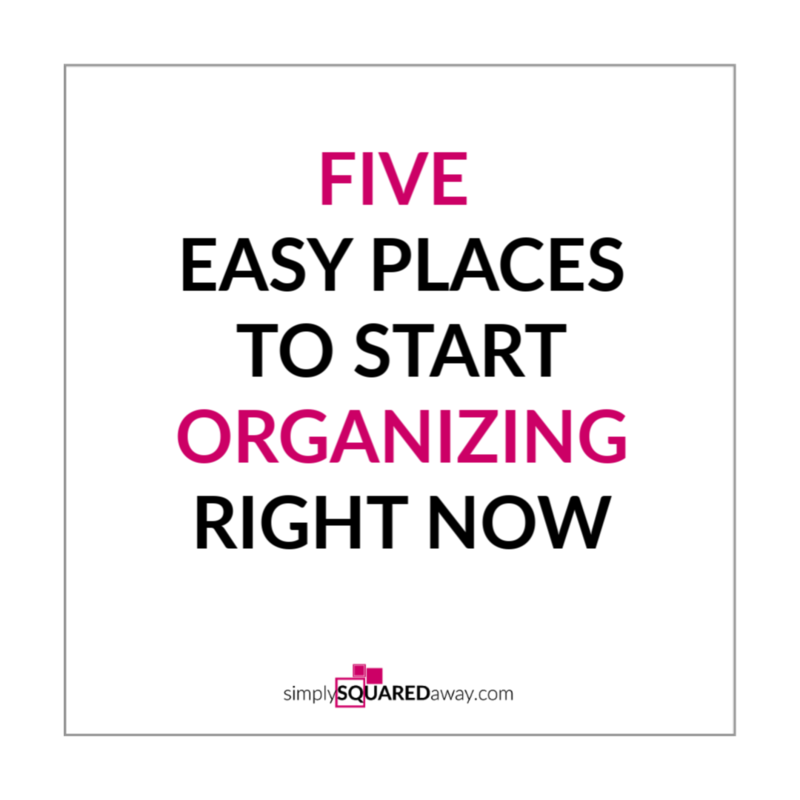 Five easy places to start organizing. I’m giving you a list of five easy places to start. They’re not easy because they won’t take effort. They are easy because the decisions you make may not be as sentimental as other areas. Use these steps to organize each area. First, decide what you are going to keep ahead of time. Exactly how many of this item do you use daily? Weekly? You don’t need more than you use. Wash and replace weekly. The end. That’s all you need. Simplify. You will be amazed how easy life will be. 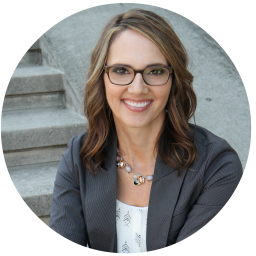 Having less to move, manage and organize will reduce the amount of time you need to upkeep, organize, and manage. Less work. Even less cleaning. For example, the most cups/mugs you’ve ever used with company is ten. You should keep ten. The most socks you could use in a week is seven. If you wear seven dress socks and change into seven athletic socks the most you’d need is fourteen. Then, just to be nice, add two specialty, cute socks and two for boots and you’re set! A total of 18 socks. Decide this BEFORE you even open the sock drawer. Next, empty the space out. If you have more of the same items around the house, gather them all together in one place. If some items are dirty, wash them and add them to your pile. While the space is empty, clean it. Wipe down the shelves. Vacuum out the drawer. Wash out the space. Get the vacuum into the corners and along the floor boards. Remember what you decided to keep ahead of time? Choose your favorites to fulfill that number. If you chose to keep ten cups/mugs, then pick your most favorite one. Then, your next most favorite one. and your next. Until you have ten of your favorite mugs chosen. You don’t even need to look at the rest of the items. Just donate them all!! You’ve kept what you decided you need. You’ve chosen your most favorite items. You can now purge the rest of what you have. 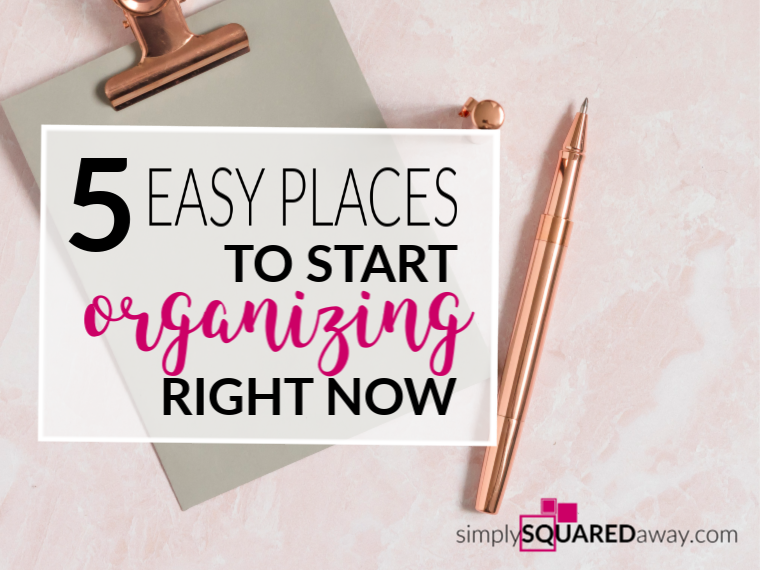 Here are five easy place to start organizing right now. Decide what you will keep in this space before you even open the door. How many hair products, toothbrushes, deodorizers, etc do you need? Empty the space. Clean the space out completely. Choose your favorites of the things you decided to keep. Donate, throw, or recycle the rest. What if you only had one color of glasses or one type of glasses in different colors? And they all matched! One of my organizing clients moved to a new house. In the process, she didn’t unpack any of her old mix-matched glasses. She bought one new set and has never been happier. How many do you need? Decide before you open the drawer. Pick your favorite ones that you wear all the time. If you don’t find the number you want to keep that are in good shape, get rid of them and add it to your list of things to invest in. This should be easy. 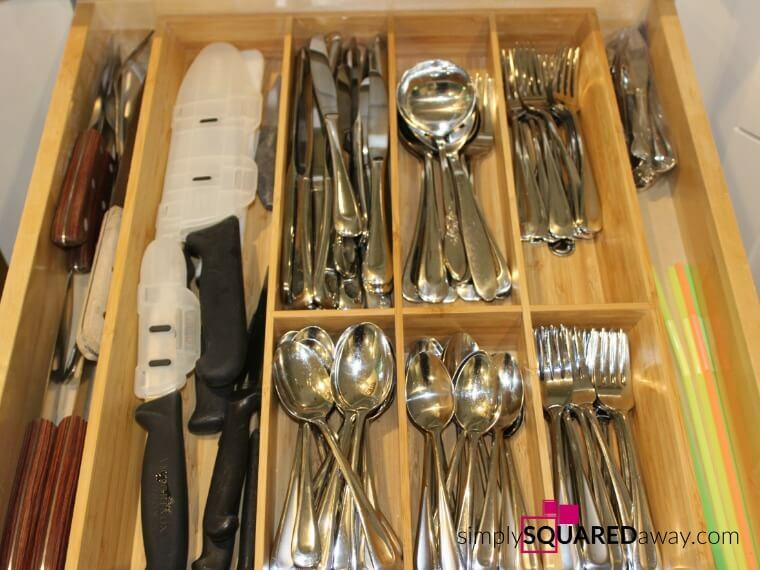 Before you open the drawer decide what you are going to keep in the silverware drawer. One set of matching silverware? Knives? Serving ware? Then, empty it and then clean it out. 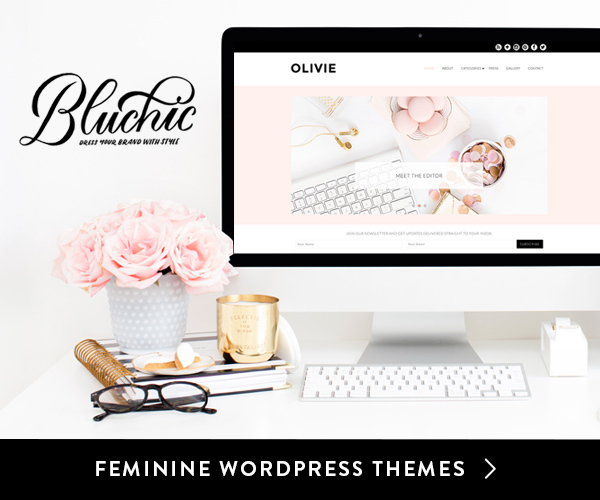 Decide if you need a new organizer (my favorite.) Don’t put anything else in the drawer. It is important, again, to decide the purpose of this table/stand before you even open it. Place only the favorites of what you decide would live here. Get in a routine and continue doing one space at a time.